Grover Norquist Contradicts Grover Norquist : It's All Politics Grover Norquist, Washington's most feared anti-tax advocate, backtracked from remarks he made to the Washington Post editorial board in which he suggested that a lawmaker who voted to allow the Bush-era tax cuts to expire wouldn't be guilty of violating the anti-tax pledge he has gotten so many to sign. 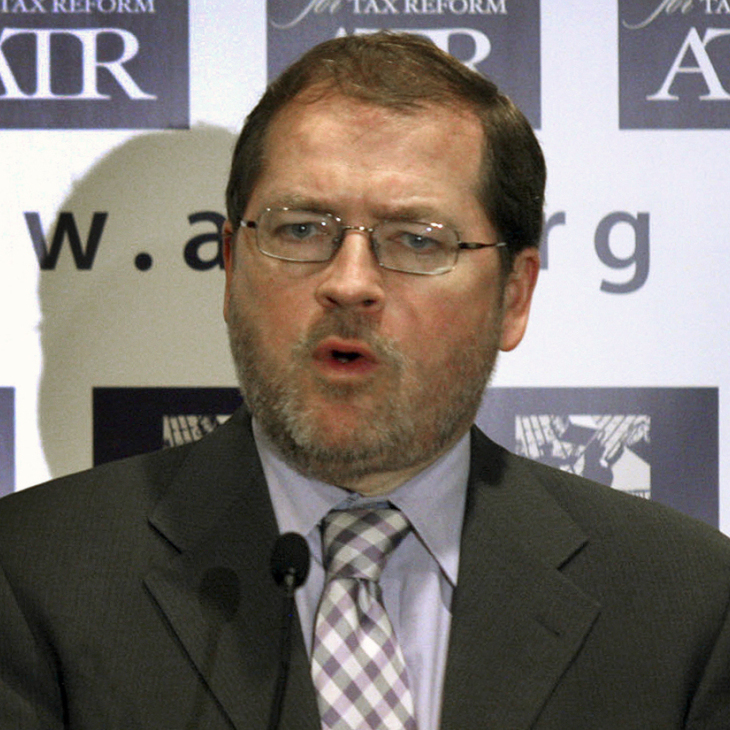 Americans for Tax Reform President Grover Norquist speaks on Capitol Hill in April. Grover Norquist, the godfather of Washington's anti-tax activists, backtracked from remarks he made to the Washington Post editorial board in which he suggested that a lawmaker who voted to allow the Bush-era tax cuts to expire wouldn't be guilty of violating the anti-tax pledge he has gotten so many to sign. ATR opposes all tax increases on the American people. Any failure to extend or make permanent the tax cuts of 2001 and 2003, in whole or in part, would clearly increase taxes on the American people. In addition, the failure to extend the AMT patch would increase taxes. The outlines of the plans are deliberately hazy, but it appears that both Obama's Simpson-Bowles commission proposal and the Gang-of-Six proposal dramatically increase taxes on the American people. It is a violation of the Taxpayer Protection Pledge to trade temporary tax reductions for permanent tax hikes. The present conversations in Washington should focus totally and exclusively on reducing government overspending. President Barack Obama has increased the annual federal budget by almost $1 trillion dollars. ATR has not altered either its policy positions or opposition to all tax increases whatsoever in any debt negotiations. The Washington Post editorial board has blog post containing audio of its journalists' conversation with Norquist. It does appear he said what the Post reported he said, that allowing the Bush tax cuts to expire, since they were temporary to begin with, wouldn't technically be scored as a tax increase by his organization. Earlier Thursday, Democrats ran towards Norquist's statement to the Post as though it were an oasis in an arid land. They were actually quoting him and, for once, not disdainfully. But it was all apparently a mirage.